AMiCS™ (Asset Management / inventory Control System) is the Best-In-Class software tool developed by JEDEX to provide an effective and efficient way for our oil & gas customers to manage the life cycle of their fixed assets. AMiCS™ maximizes the visibility of all inventoried assets across the company. AMiCS™ provides a seamless solution for oil and gas companies to manage their controllable assets, including data collection, cataloguing, redeploying, tracking, maintaining and external marketing & sales of Surplus assets. AMiCS™ is user-friendly, web-based and completely scalable as your number of users and inventory levels change. JEDEX designed AMiCS™ so that producers can locate, redeploy, and track the movements of their production equipment online 24/7, anywhere in the world. You’ll know what’s Active, Idle, Rented and Surplus – enabling you to quickly redeploy equipment where it’s needed instead of buying something you already own. As well, you will be able to proactively identify and return redundant rental equipment. AMiCS™ will also help you identify and monetize your Surplus assets that don’t generate revenue. Any equipment you’re tracking in AMiCS™ that you put up for sale can be automatically and immediately listed for sale in AMiCS™’s public online Surplus Equipment Catalog. AMiCS™ software is equipment centric, and tied to a location, not item or part centric. Each equipment record contains detailed information about all major components for that asset. For companies that may have inventory located in storage yards or other third party facilities, a virtual inventory location can be set up in the database. All descriptive fields in the database are searchable, i.e., summary description, location, serial number, boilers branch number, manufacturer, federal registration number, property code, etc. AMiCS™ is a software solution that is customizable to fit the unique needs of each user company. Also, AMiCS™ is fully supported by JEDEX to the level required by each customer. Your AMiCS™ equipment database can be the core of your Asset Management Strategy. Locate, redeploy and track the movement of your equipment online 24/7. Employees know what’s Active, Idle, Rented or Surplus – enabling them to quickly redeploy equipment where it’s needed. AMiCS™ also helps identify and monetize the assets that don’t generate revenue. Your employees across the company can have secure online access to all inventoried company assets and can more effectively and efficiently plan and perform production and operations activities. AMiCS™ allows you to attach digital pictures of the asset, as well as any document – maintenance records, purchase orders, drawings, manuals, etc. – to each equipment record. Each attachment is viewable at the touch of a button. AMiCS™ software is web-based and licensed, not purchased and installed on your system. There are no modules to buy, no fear of the software becoming obsolete, and no need to add software to you existing servers; if you can access the internet either from a computer or smart phone, you can access your AMiCS™ system – with the proper passwords. And it’s fully supported by JEDEX, including customizing to your company requirements. User training is tailored to each user’s role & responsibilities as determined by the Company’s Workflow Model. JEDEX also provides ongoing technical and user support. AMiCS™ implementation and usage follows proven, sustainable, repeatable and defendable processes for project scoping, definitions, data collection, valuation, internal asset management and redeployment and external sales which incorporate industry best practices in full cycle asset recovery. JEDEX and AMiCS™ use a standardized naming convention for equipment based on commonly accepted industry practices, allowing authorized users to search effectively and efficiently for equipment in their databases. 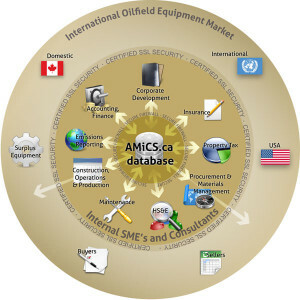 AMiCS™ incorporates the oilfield equipment status and condition categorization scheme developed by PASC. The result: an industry-standard equipment condition rating system that is accurate, defendable and repeatable. Assets are listed with Fair Market Value, ensuring a current value is attached to each asset. AMiCS™ is configured so the person approving material transfers in the system is not the same person who created them. AMiCS™ creates an audit trail that can be used for Sarbanes-Oxley (SOX) compliance and audit requirements. Ideal for companies of any size; AMiCS™ is scalable and designed to fit your company’s specific needs. AMiCS™ subscribers have secure access to all their equipment records in AMiCS™. This database is password protected and the website is VeriSign Secured. Permissions for viewing, editing, approving MT’s etc. per authorized user are defined by each company and programmed by JEDEX. AMiCS™ automatically emails the right people across departments at every stage of the Material Transfer or record approval process, dramatically reducing your administration time. For Joint Venture accounting, Asset Retirement Obligation, insurance, and property tax purposes.